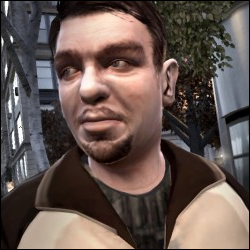 Cavalcade of Cynicism: Deleted Friend activities from Grand Theft Auto 4. Deleted Friend activities from Grand Theft Auto 4. Is three years too late to hop on the bandwagon? Is there even a bandwagon to hop on? Who gives a Caligula-organised buggering anyway. "Hey Cousin what are you up to? Let's get our anuses bleached!" "Hey Cousin what are you up to? Let's organise a gay pride rally!" "Hey Cousin what are you up to? Let's buy fancy 17th century replica pocket watches!" "Hey Cousin what are you up to? Let's actually go IN A SANDBOX!" "Hey Cousin what are you up to? Let's compare toenail clippings!" "Hey Cousin what are you up to? Let's drink responsibly and safely walk home!" "Hey Cousin what are you up to? Let's upgrade our broadband to a more reliable provider!" "Hey Cousin what are you up to? Let's clear out the attic!" "Hey Cousin what are you up to? Let's do Bill Cosby impressions and hurl fashion-based critique abuse at pedestrians!" "Hey Cousin what are you up to? Let's make a box fort!" "Hey Cousin what are you up to? Let's convert protein into energy!" "Hey Cousin what are you up to? Let's wear inappropriate hats at social situations that call for an entirely different category of hat"
"Hey Cousin what are you up to? Let's edit and sabotage the Wikipedia page of Henry 7th with the facts of Henry the 6th!" "Hey Cousin what are you up to? Let's play Wand of Gamalon!" "Hey Cousin what are you up to? I wonder what's for dinner!" "Hey Cousin what are you up to? Let's eat octorocks!" "Hey Cousin what are you up to? Let's bomb some dadongos!" "Hey Cousin what are you up to? Let's put on our red shoes and dance the blues!" "Hey Cousin what are you up to? Let's wash out our used cans and containers for the recycle collection"
"Hey Cousin what are you up to? Let's shave each other!"